Kiki and Oz are visiting regularly and in good health. Oz is back-riding, but occasionally ventures off a short way on his own. Dexter has been seen around quite often, usually watching over Kiki and Oz. I'm not sure if he's looking out for Oz, who is quite likely his son, or whether he's waiting for an opportunity to mate with Kiki. Amiri is still around and also in good health. 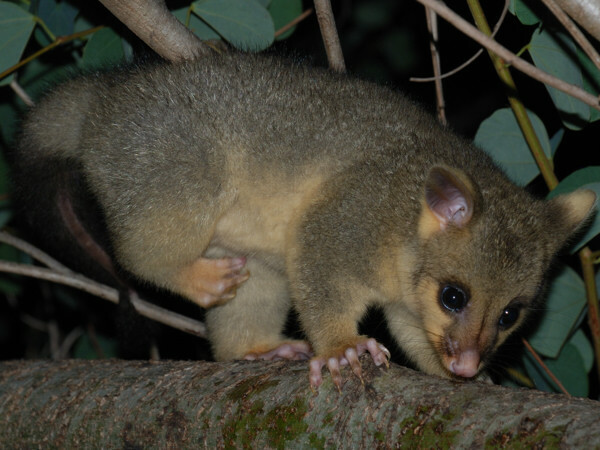 He's looking more and more like an adult possum all the time. Unfortunately, Wasabi is having some problems. 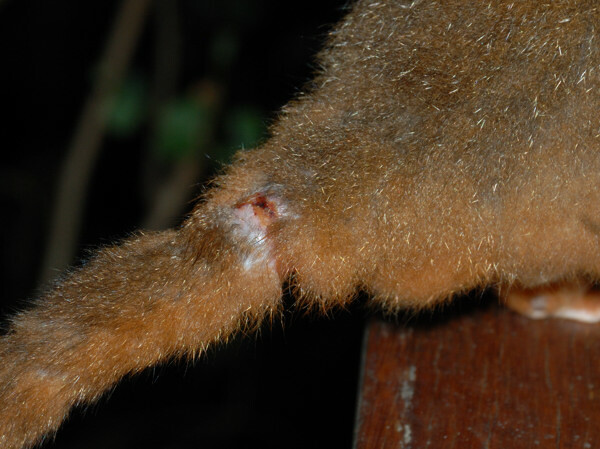 The wound at the base of his tail noticed on the 10th Feb is not getting any better, and there are also other wounds and bald patches on this tail, including a nasty raw area underneath. The exact cause is unknown. It could be the wound keeps getting re-injured due to environmental factors (e.g. an unsafe sleeping place), however there is also some infection present and possible evidence of demodectic mange. Since demodectic mange, and wounds that don't clear up on their own, are both often related to stress, it's quite likely the underlying problem is stress. Although his eye problem isn't noticeably affecting his ability to get around, it might still be hampering him to some degree and adding to his stress level. 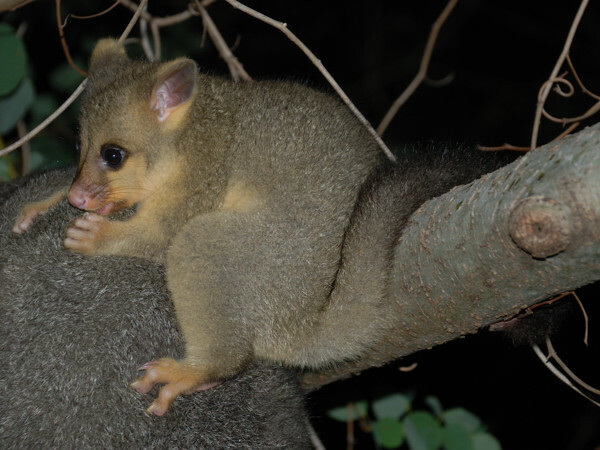 Given that ringtails are supposed to be more susceptible than brushtails to stress, this presents an unpleasant dilemma. It seems that things are getting worse and he needs treatment, but capturing him and bringing him in to a vet - which would seem to be the logical thing to do - is likely to be so enormously stressful that it might make things worse. 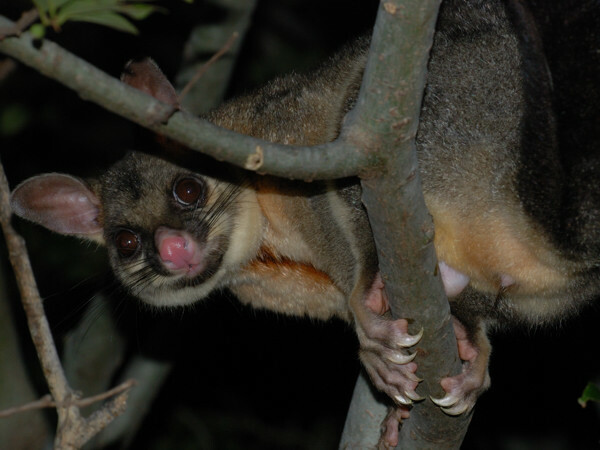 Treatment with Ceclor isn't an option because it's generally accepted that oral antibiotics must never be given to ringtails. I believe the evidence for this isn't quite as conclusive as people make out, but I wouldn't even consider doing it without good evidence that it works. Also, out-patient treatment is problematic because Wasabi often disappears for considerable periods of time. After consultation with two vets and some debate, the plan is that Wasabi will be captured and treated with Baytril and Ivermectin. Baytril is an antibiotic which will be given by injection and Ivermectin is an antiparasitic effective against mange. Both are fairly safe medications with few side-effects. To eliminate the stress of being transported to some unfamiliar location for treatment, I have constructed a possum aviary out of a flat-pack chicken shed. It's not as large as I would like (I was limited by what was available off the shelf), but it appears python-proof and a variety of fresh leaves and two sleeping places have been provided. Wasabi has not visited for the past two days, so the waiting game to capture him and begin treatment begins. 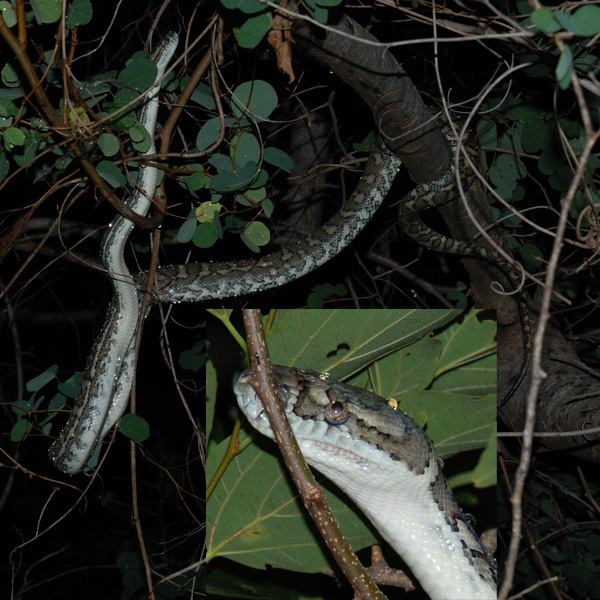 Tonight, a possible reason why he might have been keeping away appeared, in the form of a 1.2 m carpet python (the first one seen so far this year) right in the possum feeding area. In principle I accept the right of pythons to go after their natural prey, but this one was pushing its luck and got a good soaking of cold water for its troubles. 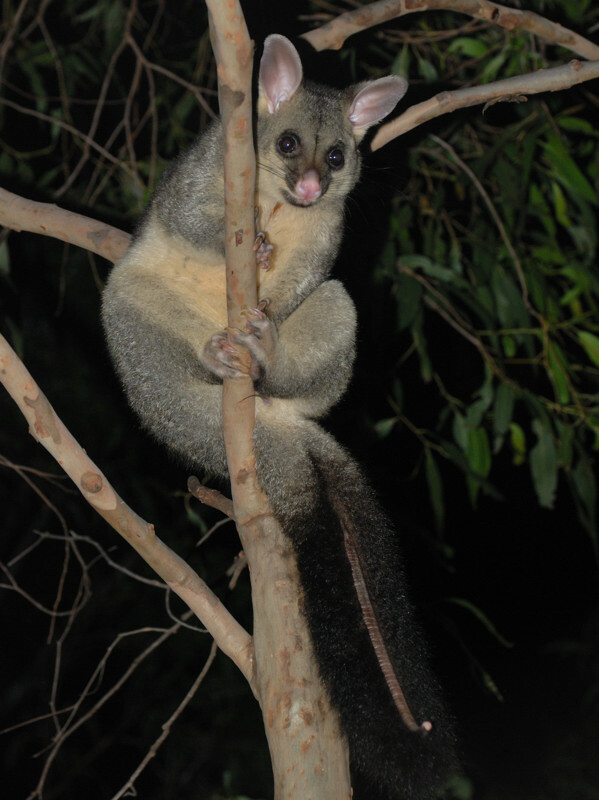 Wasabi's tail looks very similar to Oli's tail injury, for which our vet gave us Betamox Palatable Drops - luckily Oli's not a ringtail so can be given antibiotics. May we ask where you purchased the aviary? It looks great for a few days stay, certainly better than the dog travel box Oli had to spend three days in (mind you he used the time free of predators to sleep around the clock). You've made it very welcoming. Hope Wasabi turns up soon. 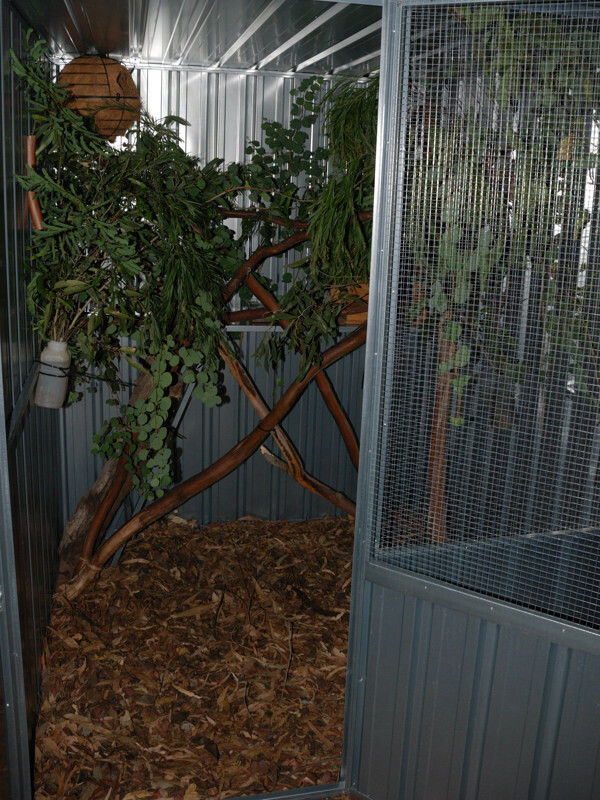 The Aviary was a "QIQ FIX Fowl House", model YSFHZ151519, which was purchased from Bunnings. It's 1.5 m square by 1.9 m high and cost $300. There wasn't any special science behind my choice, other than it was the largest one I could find at the time. The pack is small enough to fit on the roof rack of a car, but it's really heavy and will require two people to lift. Assembly is very fiddly; much more so than you might imagine. It takes several hours to put all the pieces together and you have to follow the instructions exactly. The instructions are also misleading in one place where they say to assemble the two side walls the same; you actually have to assemble one of the walls as the mirror image of the other. In several places, the sharp ends of the screws project inside the shed and would be a danger to possums leaping around. I replaced these screws with pop rivets. The wire mesh has to be washed with a vinegar solution before use to remove excess zinc coating. I think this is mainly for birds which might chew on the wires, but is probably worth doing anyway. If snakes are a problem, there are some gaps under the eaves caused by the corrugations in the roof that should be blocked up. I don't think the gaps are large to admit a possum-eating-sized snake, but even a small snake getting in could make things stressful for the possum. I covered these gaps with gaffer tape, but in the longer term, fixing wire mesh over them would be better. The shed doesn't come with a floor. The instructions assume you're going to put it on a concrete pad, but I just sat it on a brick patio. The thing to consider here is that if you just put it on the ground, it's possible (in theory) that snakes could burrow in or possums could burrow out. Also, the shed should be fixed to the ground to stop it blowing over in a storm. Thank you. As always the info you provide is both helpful and useful.